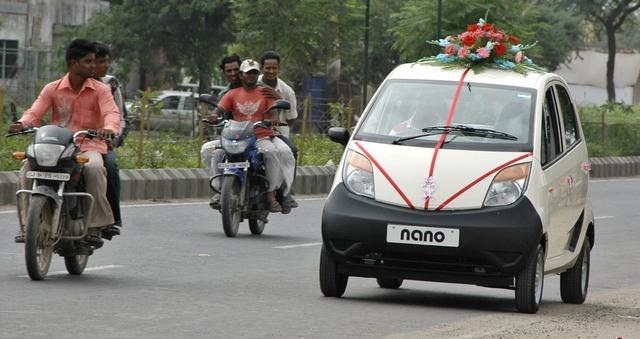 After last month’s poor results, Tata has been busy trying to resuscitate the Nano with new TV ads, easier financing and an extended warranty, and it worked so far: the Nano is #12 in December with 5,784 sales, its best month since July. Let’s see if this recovery will last into 2011. At the top of the ranking, the Maruti Alto stays well ahead and finishes the year at 300,950 sales, the first time in Indian car sales’ history that a model sells over 300k units in a year. The Hyundai i10 is #2 at 159,158 units, but dropped to 4th in December. The Maruti Wagon R is #3 in 2010 at 156,509 sales and #2 in December, and the Maruti Swift is #4 this year with 142,549 units (#3 in Dec). The Tata Indica and Maruti Dzire (a Swift sedan) are also above 100k sales this year. December highlights also include the first appearance in the Top 20 of the new VW Vento (3,160 sales), the Skoda Fabia breaking into the Top 30 for the first time at #26 and the very first Toyota Etios sales at 407 units. December Top 30, Full Year 2010 Top 40 and Summary Table of all 2010 Monthly figures for the Top 40 models below.